We continue to be grateful to Seattle voters for approving the Seattle Park District in Nov. 2014. Photo: Jeremy Dwyer-Lindgren/Woodland Park Zoo. Of all the projects in construction, roof repairs, HVAC maintenance and utility upgrades are unquestionably not exciting, but as any builder knows, this essential infrastructure work creates a safe and sturdy foundation for the flashy projects we ogle over in glossy magazines. 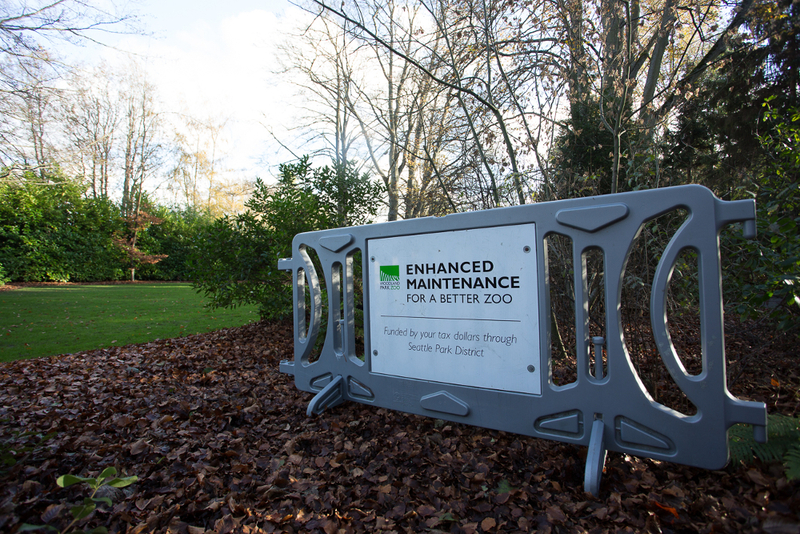 At Woodland Park Zoo, these infrastructure projects are way more than just maintenance. This work is central to the health and comfort of our residents—the 1,200 animals who call this place home— and the humans who care for them. That’s why we continue to be extremely grateful to Seattle voters for passing the Seattle Park District ballot measure nearly two years ago. 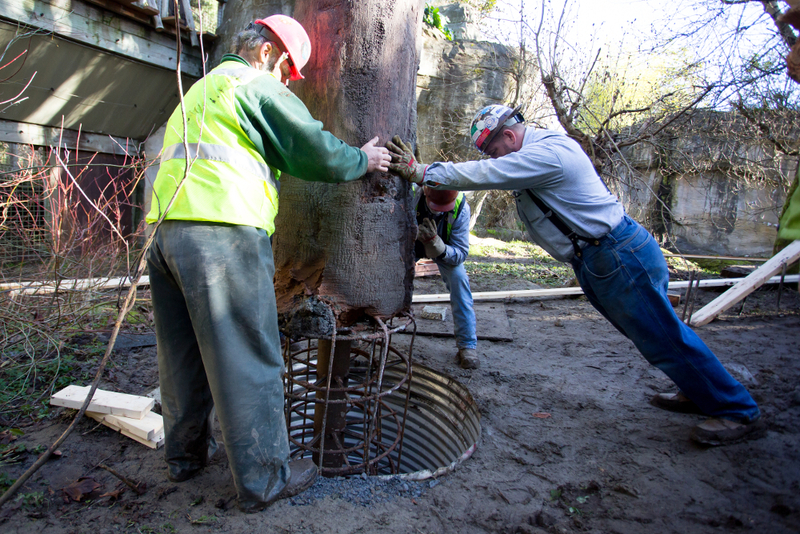 With major maintenance funding provided by the Park District—about $1.8 million a year—the zoo can tackle a long list of infrastructure projects not uncommon to a park built over 100 years ago. We'd like to take some time in this season of gratitude to highlight a couple of important—and pretty cool—projects completed in 2016 made possible with Park District funding. 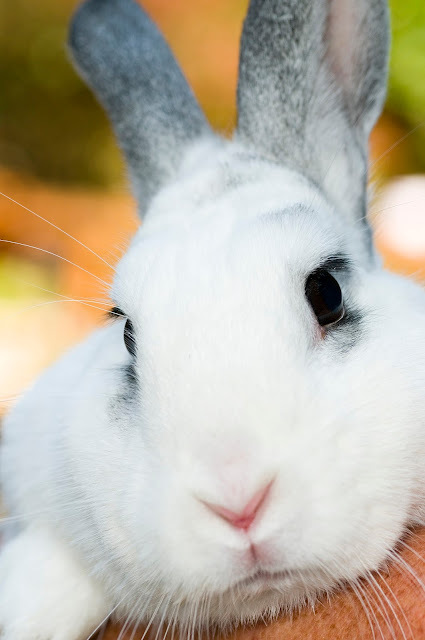 Both bodies of work directly serve our animal families, and in one case, help us fulfill our mission to save animals from extinction, proving that not all major maintenance projects include replacing carpet and digging trenches. Next time you’re visiting the zoo, take a closer look at the trees outside in the orangutan exhibit. They must be real… right? Actually, several of these trees are fabricated by the zoo’s incredibly talented exhibits team. By fabricating trees and other exhibit elements, this crew can build structures that specifically meet needs of the animals using them. And from time to time, just like in your yard at home, a refresh is needed. 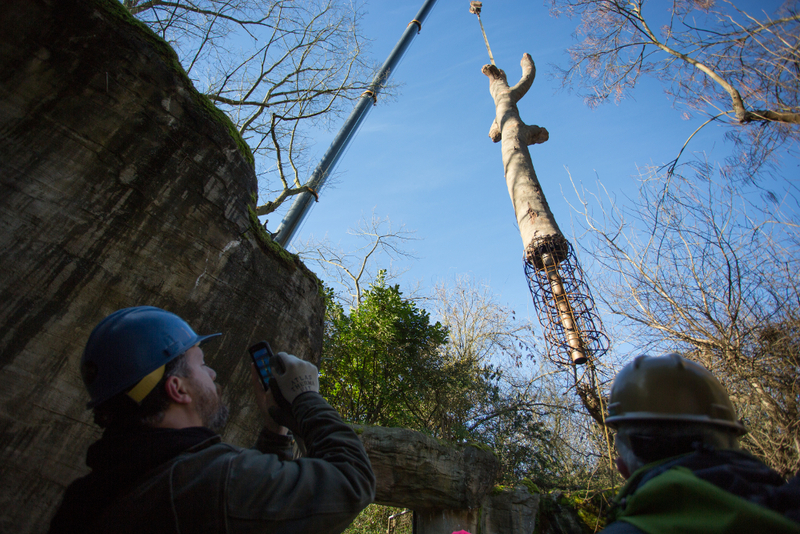 In spring of 2016, one horizontal and three vertical trees were added to the west side of the orangutan exhibit, designed through close consult between our exhibits and animal management teams. These recently added structures offer new climbing opportunities for the orangutans, and a quiet place for alone time when desired. This type of improvement allows the zoo to continue to provide excellent welfare for these highly intelligent apes. Thanks to Seattle Park District funding for making it possible to create and install these much-used trees. Turtle species in Asia are facing a crisis of epic proportions, including members of the smaller-bodied Asian box turtle family. All but one of the 12 species of Asian box turtles are listed as threatened or endangered due to international pet trade and use in traditional eastern medicine. 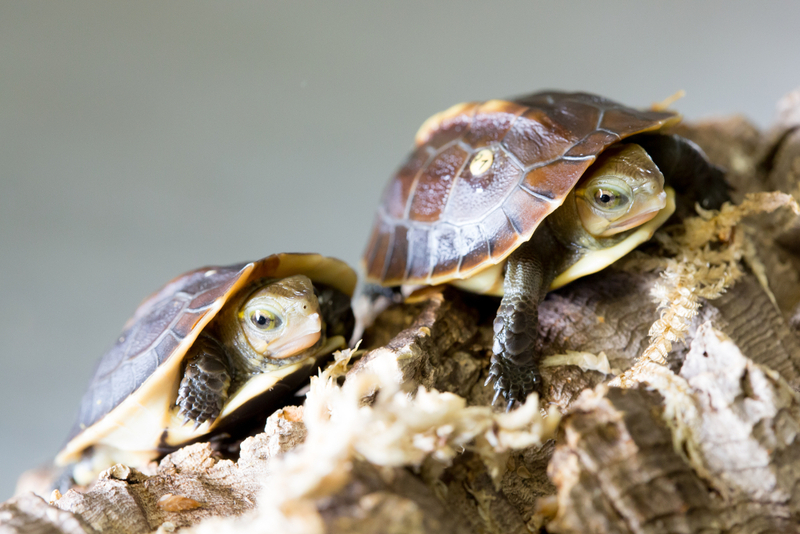 The time is now to help these little turtles—and with Park District funding, Woodland Park Zoo is doing just that. Starting this winter, we’ll contribute to saving Asian box turtles by launching a breeding program for two species, the Indochinese box turtle and the yellow-margined box turtle. But first, we needed to renovate a room in our Day Exhibit to create the perfect conditions for these turtles. This 130 sq. ft. temperature-controlled space is all the room the small turtles need to thrive at the zoo, along with the state-of-the-art filtration system we’re installing to reduce water usage. The new equipment and reconfiguration of an existing behind-the-scenes area was made possible by Park District funding. When the first turtle hatchlings appear, we’ll surely feel thankful to Seattle voters for helping us save these beautiful little turtles from extinction! 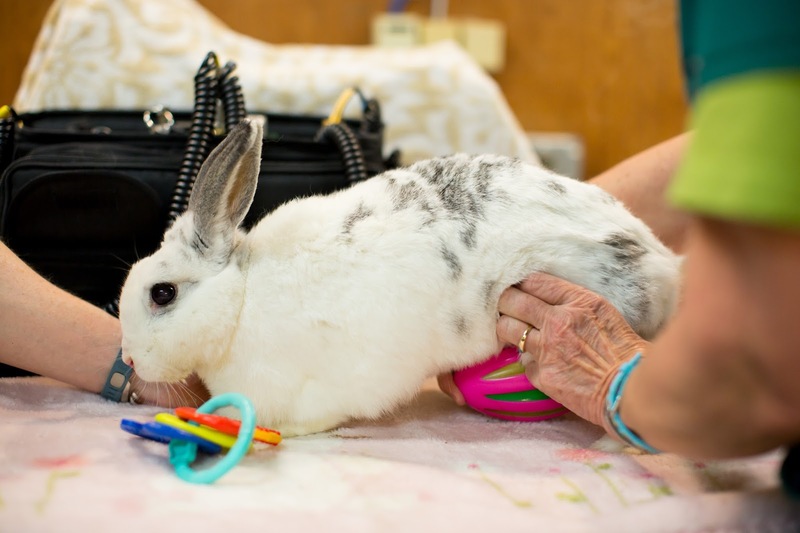 Watch video: Emma the rabbit receives acupuncture and massage therapy. When we think of aging, we look to our elders to show us how it’s done, and here at the zoo there are some furrier examples of aging gracefully. Getting older can be rough on the body, but with the right health care plan, assistance from geriatric specialists, physical therapy, medication and lifestyle changes, people can enjoy many active, healthy golden years. For decades, humans have known the healing benefits of physical therapy. Today, rehabilitation techniques are emerging as a new standard in best animal care programs in zoos around the country, and Woodland Park Zoo is at the forefront of providing thisspecialized care. Meet Emma, a 13-year-old English spot rabbit. Emma has enjoyed an illustrious 11-year career as an ambassador animal at Woodland Park Zoo. Emma has been a special presence for many zoo visitors, whether hopping into a birthday party, greeting folks during Bunny Bounce, or just being a sweet, easy-going animal to introduce to a quiet child. Emma’s keepers are grateful for her mild-mannered demeanor and patience, and they want to ensure that her retirement is healthy and happy. Well-cared-for house rabbits typically live 8 to 12 years so, at 13 years old, Emma is geriatric. Like many geriatric patients, Emma is experiencing the aches and pains of getting old, particularly arthritis in her knees. To help relieve the pain, she is under a comprehensive treatment program that includes acupuncture, massage, laser and heat therapies, and joint supplements. Emma receives laser therapy and massage, often with heat, twice a week and acupuncture two to four times a month at the zoo’s veterinary hospital. 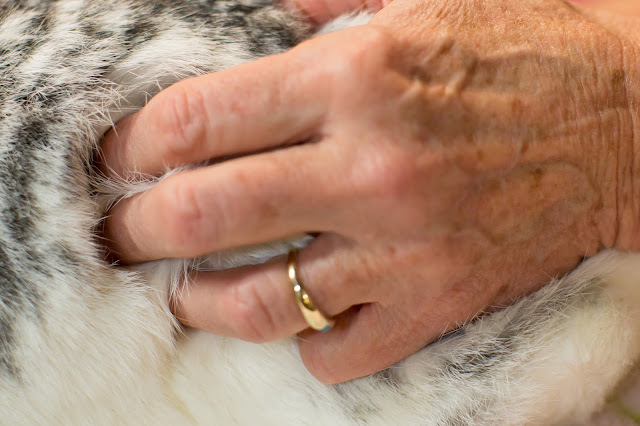 Is there anything more adorable than a rabbit massage? We think not. Emma is in great hands. In 2012, our senior veterinary technician, Harmony Frazier, became the first licensed veterinary technician in a zoo to become certified as an animal rehabilitation practitioner; she is also licensed as an animal massage therapist and trained as an animal osteoarthritis case manager. 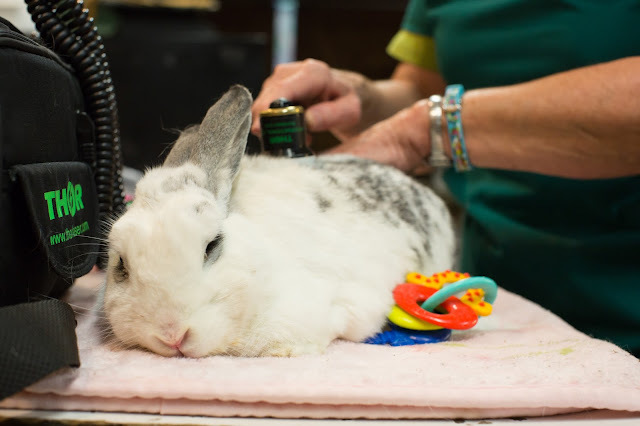 So, how does a rabbit receive massage and acupuncture? 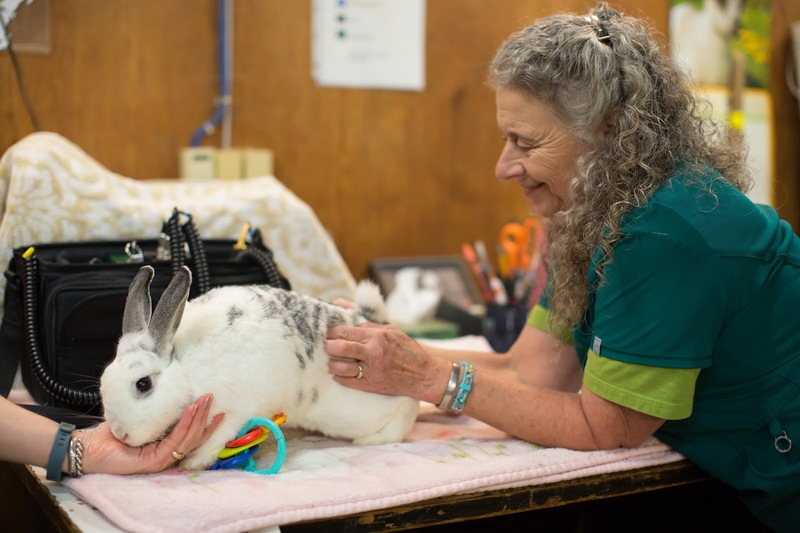 For acupuncture, Emma's keeper Diane brings the rabbit from the Family Farm into the animal health building once a week or so. She arrives in a small crate, much like a pet carrier you would see on an airplane. Emma’s crate includes a soft pink blanket (treatment fit for a princess). 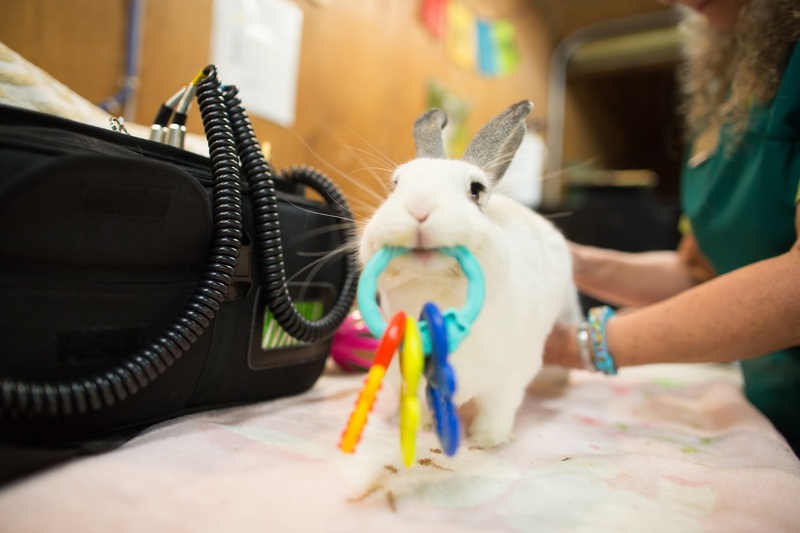 As soon as Emma arrives at Animal Health, she is placed on a table with a soft towel and a few toys (such as the teething keys above) nearby. The acupuncture program begins with a light massage from her keeper as the veterinary techs do a quick check on Emma's weight, eyes and ears. During this time, her keepers also update the veterinary team on Emma's appetite and behavior, two indicators of health. When the team is ready for the treatment to begin, Dr. Darlene starts with one or two very tiny acupuncture needles, which she inserts into Emma’s furry forehead first. Emma does not flinch. Seeing acupuncture needles inserted into an aging rabbit is not something you see every day (even when you work at a zoo! ), but Emma is used to the routine and appears quite relaxed. Emma plays with her key chain and pesters her keeper for some more pats while Dr. Darlene continues to place the needles along Emma’s back and neck. The tiny pink-tipped needles match Emma’s pink blanket; acupuncture has never been cuter. Emma allows Dr. Darlene to place up to 15 needles into her back, hips, neck and hind legs. The tiny needles are left in for about 15 minutes, then carefully removed. Watching the process, it seems as if Emma is already more relaxed; her little bunny breaths are even and calm. She is the picture of pampered, as she nibbles on her key chain and keeps her eyes on Diane. 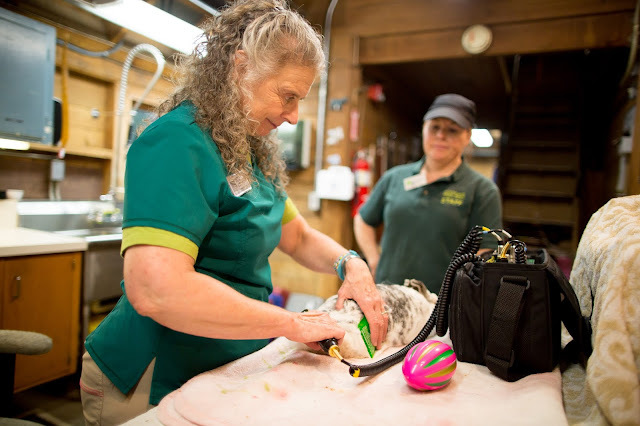 Therapeutic laser, hydrotherapy, stretching and massage, and exercise for strength and flexibility for the prevention and treatment of osteoarthritis are among several techniques being incorporated into the animal health program at the zoo. Massage therapy sessions are much the same, except that twice a week Harmony visits the Family Farm to perform therapeutic massage and heat therapy on Emma. “It is particularly beneficial for treating age-related changes, such as arthritis, and can help reduce the need or amount of medication required to keep the patient comfortable,” explains Harmony. Harmony performs heat therapy on Emma's hips and back while keeper Diane looks on. 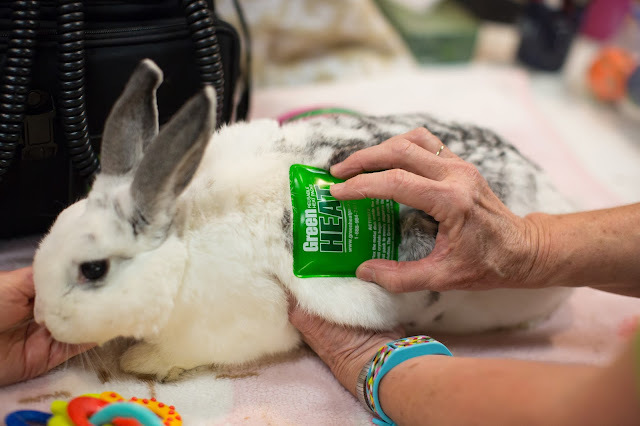 Massage therapy begins with a heat pad, called Green Heat, that is held onto the rabbit’s side. Then Harmony uses laser therapy, a portable machine called Thor Photomedicine lite. It looks like a car battery jumper, but it’s actually specifically built for mobile heat therapy. During the massage therapy sessions, Emma melts into relaxation as Harmony massages her back and hips. The massage lasts about 15 minutes, and keeper Diane stays by Emma’s side the entire time. As Harmony massages and soothes Emma, Diane keeps Emma entertained. Diane brings along rabbit cookies (biscuit-like treats) and a few of Emma’s favorite toys and Emma’s ball. The ball is also therapeutic, and when inclined, Emma allows Diane to place her atop the ball (picture the Easter bunny on a large egg) and this helps work the muscles in the rabbit’s hind quarters and hips. A bunny ball, used as part of Emma's therapy, is placed underneath the rabbit. This prompts Emma to stretch her muscles. The amazing thing about these therapy treatments is the speed at which Emma responds. When Emma first started therapy, she was having really low energy and not able to move around like a normal bunny. Just after a few treatments, keepers and vet staff tell us that Emma was moving around more easily, was more agile and her appetite had improved too. She was also much more engaged with her people. When Emma isn’t at her rehab sessions, you can say hello by visiting her in the zoo’s Family Farm. Look under the heat lamp for an extra cozy and pampered old rabbit. Aww, a very relaxed Emma. EDITOR'S NOTE: Adult male gorillas are known as silverbacks because of the striking silver hair that grows across their back all the way down to their hips. This is not only a mark of maturity (silver hairs appear around 12 years-old), but a sign that one might be strong and determined enough to protect his troop. In most gorilla troops, the silverback is the center of attention. He is responsible for guarding the troop against outsiders, finding choice feeding sites and playing mediator between the other gorillas in the group. 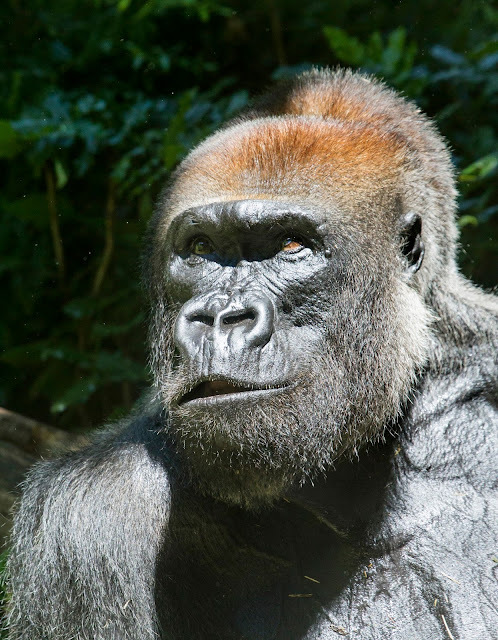 While silver hairs, larger canines and handsome red crowns (in Western lowland gorillas) are all visual characteristics of a mighty silverback, it is the personality and behavior of these males that determine if they will lead. This is the story of how one such silverback, Leonel, has come into his own as a protector, leader and peacekeeper—in part with a little help from a tiny, adorable baby called Yola. While the gorilla keepers will tell you this is a story about two very special gorillas, we'd like to point out that it is also a story about an incredibly dedicated team of zoo keepers who are, without a doubt, world-class animal care experts and profoundly compassionate and determined humans. With that, here is gorilla keeper Stephanie Payne-Jacobs with Leo's story. Leonel, photo by Dennis Dow/Woodland Park Zoo. Yola successfully stole the show at Woodland Park Zoo this past summer, but the gorilla keepers are convinced that silverback Leo is the real star of the group. Since arriving at WPZ in the winter of 2008, he has become a respected leader in his family group, a position we were uncertain he could occupy upon his initial arrival. Gorillas are social animals. They benefit from each other’s company in the same ways that human families and groups do: they build alliances, provide companionship, create a sense of safety, but most importantly, they learn from one another. This is why it was so important for baby Yola to be around gorillas from birth and why it’s wonderful that she was integrated into her group at such a young age. Leo was not afforded that opportunity. He was the first gorilla born at Gladys Porter Zoo in 1978, a time when the importance of encouraging a parent or surrogate reared infant were not fully understood. For safety concerns, Leo was moved out of his natal group shortly after birth for hand-rearing. Leo remained a solitary gorilla until age four, at which point he was transferred to the Los Angeles Zoo and introduced to a family group. Unfortunately, Leo never became a comfortable, cohesive member of that group. 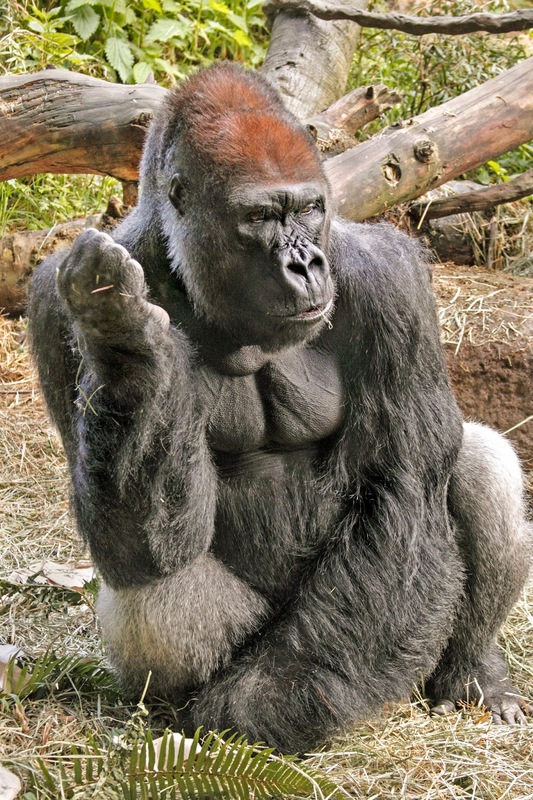 Records suggest that he seemed to lack the subtle vocal and physical cues that gorillas rely on for communicating with one another. After the LA Zoo, he lived at two other zoos, each with short-term and disruptive attempts at socialization with other gorillas. When presented with the option of bringing 30 year old Leo to Woodland Park Zoo, the keepers agreed that we were up for the challenge. Not only did we have a large number of females with varying temperaments, offering a variety of companion combinations for Leo, but we also had the space to accommodate such introductions. In addition, we had keepers who were experienced in successfully introducing non-reproductive males to females. It was decided that Leonel would come to Seattle. Leo’s first days at Woodland Park Zoo's gorilla unit were spent adjusting to his new surroundings, his new humans and the new routine. We knew that in order for him to feel comfortable meeting his new gorilla mates, he first had to know and trust the people he worked with. Once he had settled in, the process of introductions took place. These intros took many forms over the following months, as we gave the female gorillas and Leo the opportunity to get to know one another and see who clicked with whom. The females were always given the choice to join Leo or not. Our job was to observe these introductions closely and note who was choosing to spend time with Leo, how the time was spent, and who was choosing to steer clear. Nadiri, Yola, Leo and Akenji. Photo by Jeremy Dwyer-Lindgren/Woodland Park Zoo. After a long and careful process, one that operated strictly on gorilla time, Leo, Nadiri and Akenji had finally shown us, through body postures, vocalizations and proximity to one another, that they were in fact, becoming a cohesive group. Leo immediately took to Akenji, who is the more laid back, confident and playful. She was not intimidated by Leo’s size and would often engage him in play, or calmly sit near him. Nadiri seemed comfortable as well, but more as the third wheel rather than Leo’s first choice of companion. 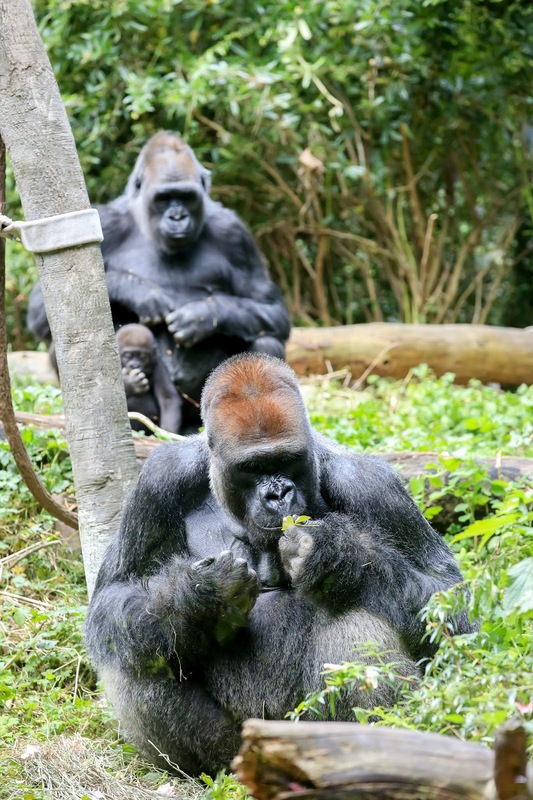 Over time, as this group became comfortably established, their roles became clear: as the silverback, Leo was the group’s (somewhat insouciant) leader, and as Leo’s favorite, Akenji became dominant over Nadiri whenever Leo was in the vicinity. When Leo was off resting in the distance, however, the terms of dominance (usually proximity to scattered food and desirable resting spots) between Nadiri and Akenji returned to an even playing field. Nadiri, Akenji and Leo. Photo by Jeremy Dwyer-Lindgren/Woodland Park Zoo. 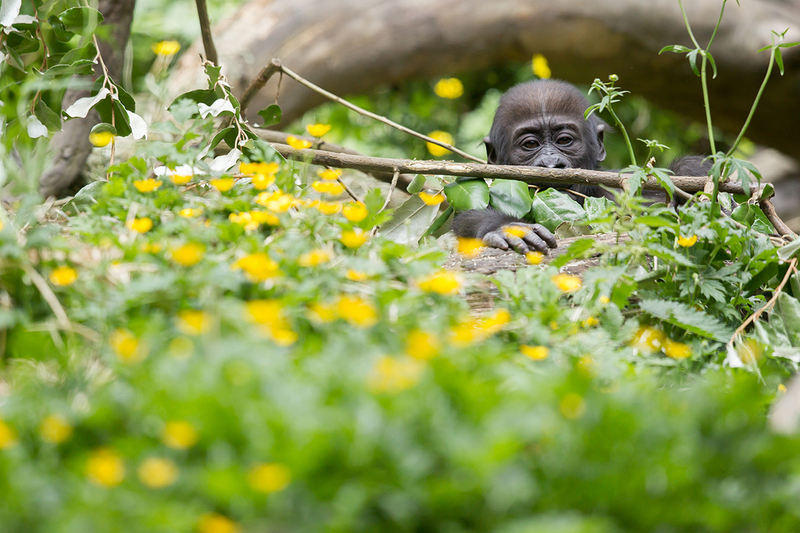 By 2015, Leo's gorilla group was an established family, but what would happen when Yola arrived? In October 2015, the zoo was eagerly awaiting the birth of Nadiri's first-born (the father, Vip, lives with another group of females at the zoo). Nadiri herself was hand-raised for the first nine months and Akenji was hand-raised for the first six months (their mother was unable to care for them), and then there was Leo. We had no idea how any gorillas in the group would react to an infant. Nadiri had been around infants in her natal group and had witnessed maternal behavior, and Akenji had been around youngsters while she was a youngster herself, but it was Leo who was the real wild card. As far as we knew, Leo had never been in close proximity to an infant. His newly found comfort as a group’s silverback would once again be tested, as the dynamics were sure to shift once Nadiri had an infant and her protective maternal instincts would give her more reason to impose some dominant behaviors. After Yola was born in November 2015, the dynamics between Akenji, Leo and Nadiri remained fairly unchanged throughout Yola’s first five months, as the baby established a relationship with her mother, Nadiri. This allowed Yola the necessary time to become more mobile and less dependent on her human caretakers. Nadiri’s presence in the group had to be somewhat fluid during this time, as separating her from Leo and Akenji for several hours a day was necessary in order to give mother and daughter the time they needed to bond. Being separated and reunited many times throughout the day became a normal part of their routine, but it did keep the group scratching their heads a bit as to what we were up to, and what was ahead. 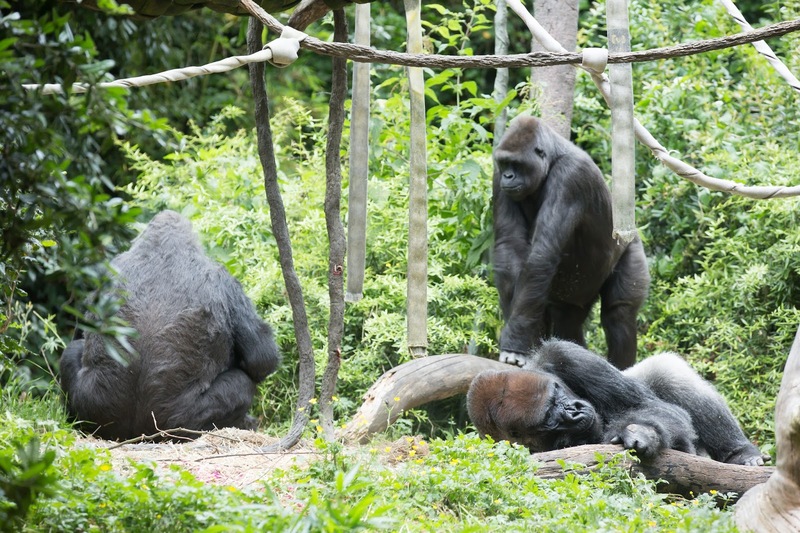 During the Nadiri and Yola visits, Leo and Akenji would often be observed playing and laughing together, and we were a little concerned that their bonding time might push Nadiri to the outer fringe of the group. She was already the submissive female of the trio, and now she’d have a baby to protect once Yola was integrated. Little did we know, we had nothing to worry about. Yola (the little heartbreaker on the left) with mom, Nadiri. Photo by Jeremy Dwyer-Lindgren/Woodland Park Zoo. It didn’t take long for keepers to notice that Leo would often situate himself in a place where he could watch Yola. Yola and her human caretaker would sit next to Leo while he was fed or engaged with another keeper, allowing Yola to gain confidence in his proximity. It was during this time that Leo showed further interest in Yola by soliciting touch through the mesh and content grunting ("Hello" in Gorilla) whenever contact was made. Leo was always calm and Yola picked up on this, establishing from the very beginning, a positive and respectful relationship with one another. Once Nadiri and Yola were spending the evenings together, we began our discussion of whom from the group we should integrate next. Before any observations of the groups reactions to Yola had been made, we had considered Akenji as the a possible first step, as she and Nadiri share a history together, and typically, females create a strong bond to unite them and keep the larger silverback in check, but Leo’s behavior towards Yola led us to suspect he may be the better choice (despite his lack of infant experience). 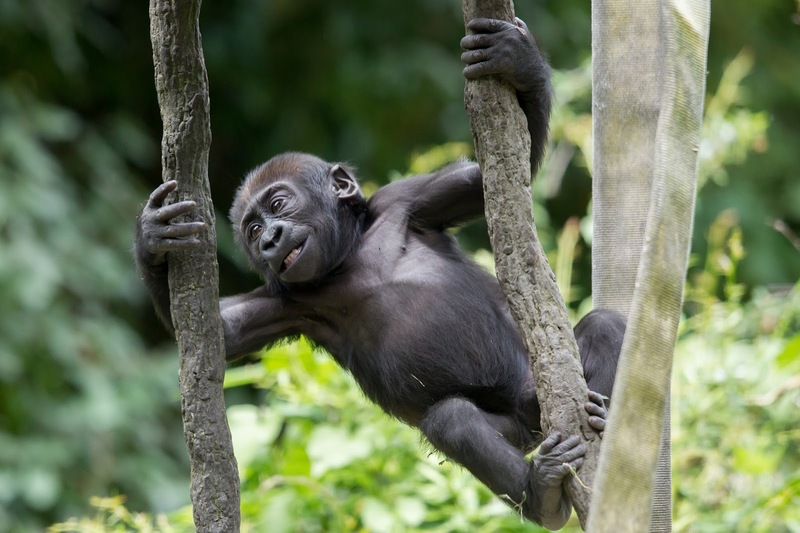 Where Leo’s approach to Yola was always positive and calm, Akenji’s behavior was just the opposite—she seemed jealous of the baby, often displaying towards Yola, trying to poke her with sticks and threat grunting towards her. Fourteen year-old Akenji, Nadiri’s sister, has always been the youngest member of any group she has lived in and just like any baby of any family, she is a bit spoiled. Akenji was having a difficult time being usurped by Yola. One of our concerns prior to introducing Leo, was Nadiri’s extremely relaxed parenting style. While the visits between Nadiri and Yola had been going well—Nadiri always being gentle with Yola—we still had not observed her pick Yola up and carry her. This was acceptable when it was just the two of them, as Yola would just follow Naidiri, but we knew it wouldn’t be enough for Yola to just amble after Nadiri once Akenji was added to the mix. We needed to see some protective mama instincts kick in, which had so far been missing from the equation. In preparation for the physical introduction with Leo, we began by inviting Leo into a shared room with Nadiri and Yola, though separated by wire mesh. This allowed Nadiri to adjust to Leo being allowed access to an area that she and Yola usually had to themselves. As Leo was given access to the back half of a room, Nadiri and Yola were given access to the front half of that room, as well as several adjacent rooms where Nadiri could move away from Leo if she felt uncomfortable. Keepers were beyond excited and close to tears when, after giving Leo access to the back room, Nadiri quickly picked Yola up and carried her out of Leo’s sight. It was the first time Nadiri had picked her up, and the keepers could barely contain themselves upon seeing this. Although Leo had been completely calm and appropriate, having him in this new proximity and configuration made Nadiri just cautious enough to exhibit protective instincts towards Yola—proving that she indeed would take care of Yola when faced with an uncertain situation. The second day, we slowly opened the door and allowed Leo to come into the same space with Nadiri and Yola. Leo was a bit nervous, so he made a very appropriate display past Nadiri and Yola and then went to sit on his favorite bed and observe from there. Nadiri again showed protective behavior by picking Yola up and carrying her from room to room. After 12 days, Nadiri, Yola and Leo seemed comfortable with one another, respecting personal space, content grunting during transitions, eating near one another, passing closely by one another, and, most importantly, agreeing to participate in the introductions each day. So far, the introduction had not only shown that Nadiri had protective instincts towards Yola, but that Leo might share those instincts as well. For these reasons, we soon felt it was a safe time to bring Akenji into the mix. Yola testing out her swinging skills. Photo by Jeremy Dwyer-Lindgren/Woodland Park Zoo. It was no surprise that the intros became a bit more animated once Akenji joined. 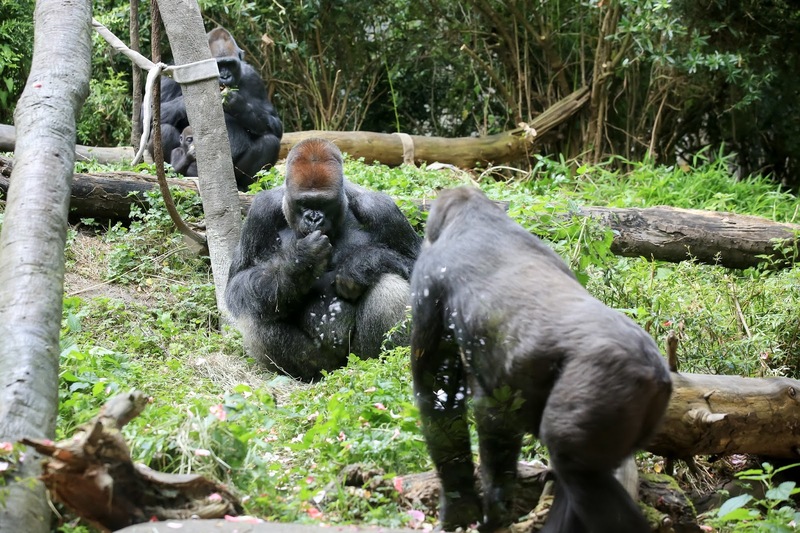 Each morning, after several initial displays, Akenji would sit down a few feet from Nadiri and Yola, occasionally trying to touch Yola and smell her. Whenever Akenji did anything to upset or scare Yola, Leo would immediately reprimand Akenji, and she soon learned she had to behave. Keepers were happily surprised to see Leo immediately show appropriate silverback behavior and stand up for Nadiri and Yola. Nadiri quickly realized that Leo was the silverback protector. 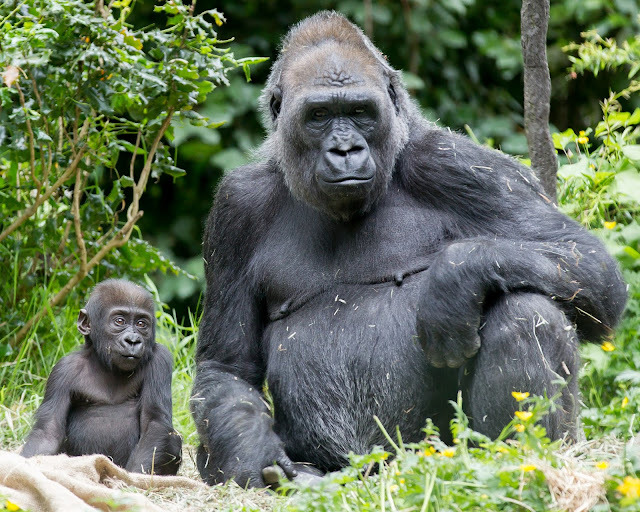 It is natural for a new gorilla mom and baby to sit in closer proximity to the silverback, and for the silverback to allow this to occur. Leo's role as silverback in keeping peace among the group further compliments his transformation into a true member of his own gorilla family. It has been interesting to watch Leo and Nadiri’s natural instincts kick in and sync together. It has also been wonderful to witness Leo and Nadiri’s relationship evolve in the presence of Yola. Whereas Nadiri had always been on the periphery of Leo and Akenji’s relationship, she now stays in close proximity to Leo. Akenji and Leo still play and enjoy each other’s company, but he now recognizes his new role as silverback—protecting Yola. On Sunday, November 20, Yola will turn one. She is proving to be a well adjusted gorilla, capable of interpreting appropriate gorilla body language and subtle vocalizations. She still steers clear of her auntie Akenji, but we’re confident that they will have a wonderful and energetic relationship once Yola is a bit bigger and more confident. Leo and Yola’s relationship couldn’t be better. It’s not uncharacteristic of silverbacks to be great dads; playing with their kids and even carrying them around from time to time, but Leo’s early experiences could have easily hindered his ability to deal well with an infant. Instead, he has proven invaluable to the group’s success. Yola really seems to find comfort in his presence, and will play with abandon near him, assured in the fact that she’s safe to do so. It will be interesting to watch Leo and Yola’s relationship grow as she gets older. Just last week, as keepers called Leo inside for the night, we were surprised to see him enter from the yard with Yola leading the way. This was a first, as she has always stuck by Nadiri during transitions. Akenji was right behind Leo (as she usually is during this transition) and when Yola saw this, she immediately grabbed onto Leos’s leg. Leo allowed this to happen, and let her hitch a ride through the threshold of the door, gently shaking her off once they were inside. Yola didn’t appreciate this, especially in such close proximity to Akenji, and screeched, causing mom, Nadiri, to run in and calm her and for Akenji to quickly leave the area, lest it cause an unwanted conflict right before dinner. This timeline of events was a reminder of how far they have all come: Yola was comfortable enough to run to Leo for comfort and safety and Leo allowed her to do so, Nadiri still came when Yola called, and Akenji knew better than to get involved. We are so thankful for these wonderful gorillas whom we are privileged to know and share our days with, and our hope is that zoo guests feel the same. The gorillas are here to teach us, encourage us and inspire us to care about the importance and beauty of their existence among us in this world. The lives of their wild counterparts depend on this understanding. 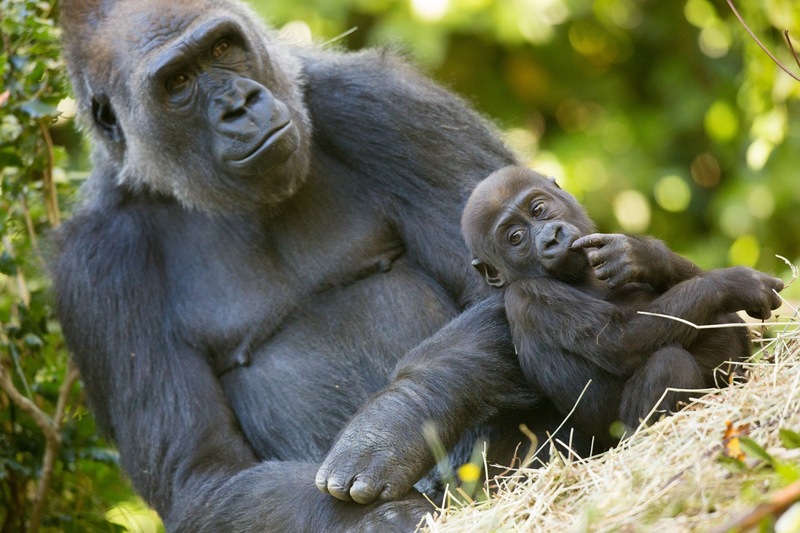 The three gorilla groups at Woodland Park Zoo are compelling ambassadors for the critically endangered gorillas in Africa threatened with extinction. Woodland Park Zoo supports conservation efforts for the western lowland gorilla through the MbeliBai Study, one of the zoo’s Partners for Wildlife. The study researches the social organization and behaviors of more than 450 lowland gorillas living in the southwest of Nouabale-Ndoki National Park, Republic of Congo. The data collected enables scientists to assess the vulnerability of populations to habitat threats, providing the groundwork for successful conservation strategies. Visit Yola, Leo, Nadiri and Akenji at 12:30 p.m. daily and remember to #GrowWithYola to share your favorite memories of this little gorilla and her incredible family. Do you know Cinnamon? Photo: Rachel Gray/Woodland Park Zoo. One of the zoo's lowest profile residents just celebrated a milestone birthday: Cinnamon, our springhaas (Pedetes capensis), turned 20. Springhaas in human care are expected to live for typically 13 to 14 years, but our little energizer bunny—as she’s lovingly known by her keepers—is still going! Though she has lived here for 10+ years, Cinnamon and her species are little known. Springhaas are native to southern Africa where there is dry, sandy soil for them to dig burrows. They spend most of the daytime in these burrows and forage for stems, roots and sprouts at night. 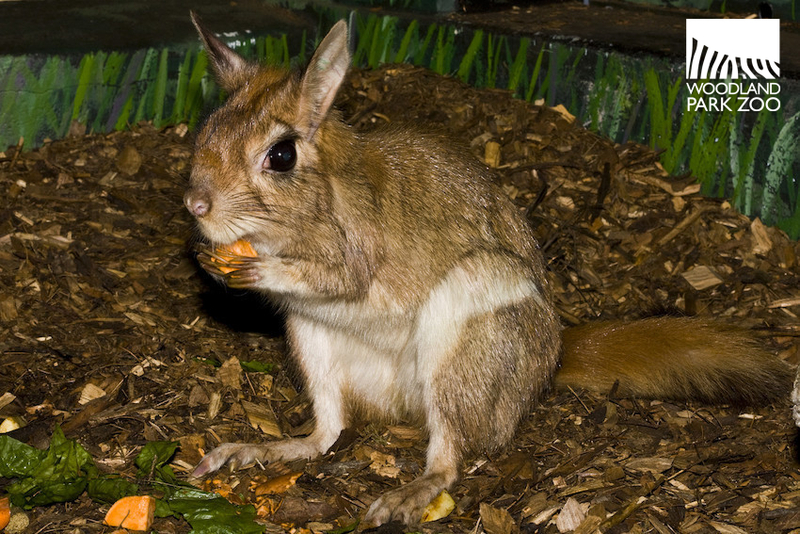 Springhaas are a type of rodent and resemble rabbits or even tiny kangaroos yet are most closely related to squirrels. They are listed as vulnerable by the International Union for Conservation of Nature due to loss of habitat and hunting that stems from the perception that they are pests and damage crops. Cinnamon has some challenges due to her advanced age, so we monitor her daily to assure her best welfare. Like many of our geriatric residents, she receives anti-inflammatories. Cinnamon takes her medication enthusiastically first thing every morning on a piece of corn on the cob, one of her favorite foods. (Her absolute favorite thing to eat is whole peanuts which she shells herself.) Once she leaves her den and starts exploring, we get a chance to see how she’s moving and getting around. Springhaas are nocturnal, meaning she is most active at night, so we also review overnight video of her if we need to keep a closer eye or have questions about her health. Even after 20 years, she’s still moving around and doing well. You may have first seen Cinnamon back when she was a resident of the former Night Exhibit. Since then she’s taken up residence in our Adaptations Building where she lives with a colony of flying fox fruit bats. You’ve no doubt spent plenty of time looking up to see the bats in action, but on your next visit, look down and you might just spot our Cinnamon. If you do, be sure to wish her a happy birthday.